It's a whole new vision for backup. It’s the latest sync technologies. It’s cloud storage. It's a new True Image supporting new devices. And it's easy to try now — whether you're installing it for the first time, or upgrading from a previous version. 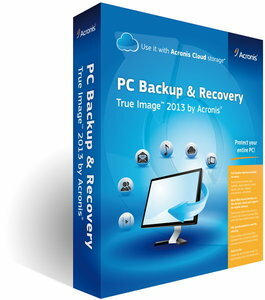 True Image 2013 Plus Pack is here to make your hardware migration as easy as a click of your mouse. No matter what the make, model or installed components of your computer, easily restore files, programs, or your entire system to different hardware, dynamic disks, and even Microsoft Windows Pre-installation Environments (WinPE). Add Plus Pack to your True Image software for the ultimate in data protection and management. New automatic backup naming is more flexible and convenient. Now user can sync his data not only between his PCs, but with mobile devices as well. User subscribed to the Acronis Cloud service now can share files and folders with one click.